The City of Hayden Veterans Commission is proud to offer community and area residents the opportunity to place the name of a veteran on brick pavers as part of the PFC Robert J. Gordon Veterans Memorial Plaza in front of Hayden City Hall. Naming rights may be purchased for $100. The veteran must be currently serving or have served under honorable conditions in the United States Armed Forces (DD-214 or other qualifying documentation of honorable service is required). Military personnel discharged prior to 1940 and organized military groups are exempt from this requirement. 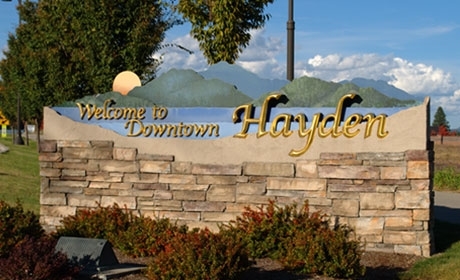 Residency in Hayden is not required. The City has two installations per calendar year: Memorial Day and Veterans Day. To learn more about the Commemorative Brick Program and the PFC Robert J. Gordon Veterans Memorial Plaza, contact the Community Services Department at 209-1080 or visit Hayden City Hall located at 8930 N. Government Way.